Mass General's Boston Marathon Partnership with John Hancock Marks 20 Years. Mass General in the 2016 Boston Marathon. John Hancock’s strong support of the Mass General Boston Marathon Teams generates much needed funding for key programs that help children, families and the entire community. Massachusetts General Hospital’s Boston Marathon partnership with John Hancock hits a remarkable milestone this year. Thanks to the financial services company’s enduring generosity, 2017 marks the 20th year in which the Mass General marathon teams have run the Boston Marathon to support the hospital’s programs. “John Hancock has really gone the distance for us,” says Peter L. Slavin, MD, president of Mass General. John Hancock donates bib numbers to Mass General, which then recruits runners to raise money to help fund the hospital’s care, research and training programs. Through this partnership, Mass General runners have raised a combined total of more than $13 million over the past two decades. John Hancock’s contributions to the Mass General community are acknowledged on the hospital’s Visionary Donor Wall. The display, located in Mass General’s main lobby, features the names of individuals, families, foundations and corporations that have made transformational gifts since the hospital’s founding in 1811. Through the John Hancock partnership, Mass General runners have raised a combined total of more than $13 million over the past two decades. Without the program that John Hancock has sustained, Mass General might not be able to offer the sort of music therapy and other programs that help young cancer patients like 5-year-old Caden Zedower. Three years ago, he was diagnosed with leukemia, a cancer of the bone marrow and bloodstream. On Caden’s first day in the clinic at MassGeneral Hospital for Children, a music therapist was there to greet him with her guitar. Soon, the young patient was playing maracas, the ukulele, bongos and an electric drum pad. Although Caden had to have a needle stuck into a port in his chest at every visit, “he looked forward to coming and spending time with his bandmates,” says Tarrah Zedower, Caden’s mom who, in gratitude, is running the 2017 Boston Marathon. This is Tarrah’s third year as a member of the Mass General Pediatric Cancer Team and, once again, she’ll be wearing one of the bibs donated by John Hancock. John Hancock is known for its strong commitment to Boston, its home for more than 150 years. Its landmark sponsorship of the Boston Marathon predates its partnership with Mass General. This is the 32nd year that the company has been involved with the legendary race. This is the 32nd year that John Hancock has been involved with the legendary Boston Marathon. In addition to helping area nonprofit organizations like Mass General secure entries, the company sponsors a variety of other marathon-related programs. Each year, it recruits and hosts the John Hancock Elite Athlete Team, which includes some of the world’s best distance runners. John Hancock also sponsors events that give local students the opportunity to meet world-class runners. As principal sponsor of the Boston Marathon, John Hancock has provided substantial financial resources, including the first-ever prize money in 1986. John Hancock’s relationship with Mass General began in 1998, when the company granted 10 bibs to the Mass General Pediatric Cancer Team, led by Howard Weinstein, MD, chief of Pediatric Hematology and Oncology at MassGeneral Hospital for Children, and himself a marathon runner. In 1998, the 10 pioneering Mass General runners raised a total of $45,000. In recent years, the Mass General Pediatric Cancer Teams have included more than 100 runners who have raised more than $1 million each year. On Marathon Day, friends, family members and hospital staff cheer on members of the Mass General Boston Marathon Team. Mass General marathon dollars provide critical support for research, where federal funding has become increasingly limited. Dr. Weinstein hopes such research will expand our understanding of the genetic pathways underpinning the childhood cancers and lead to more effective therapies. Marathon donations also account for the majority of the funding for the MGHfC Child Life Program, which helps children and families manage the stress and challenges of cancer and hospital stays. The funds are used to hire certified child life specialists, who use child-friendly teaching tools to prepare children for procedures. The specialists also accompany children during those procedures, and help them cope or distract them if needed. In addition, marathon donations support massage therapy, acupuncture, and music and art therapy for young cancer patients. Because of the marathon funds, the Child Life program has been able to offer sibling and teen support groups. John Hancock’s involvement with the Mass General Marathon Program expanded following the 2013 Boston Marathon, when two bombs exploded near the finish line while many runners were still on the course. Tragically, three died and more than 260 men, women and children were injured. Using a carefully structured response plan, Mass General staff quickly mobilized that day and treated a steady stream of patients badly injured by the explosions. Thankfully, all of the injured brought to Mass General and other Boston hospitals survived. Those memories weighed heavily on the entire Mass General community as the 2014 Boston Marathon approached. But with the continued support of John Hancock and the Boston Athletic Association, the event’s organizer, the hospital’s marathon teams came together and responded with a renewed commitment. For the 2014 race, Mass General was given additional bib numbers so that runners who had been unable to finish the previous year’s race could return. Mass General was also fortunate to receive 40 bibs that were used to create the new Mass General Emergency Response Team. Its participation pays tribute to Mass General’s response to the 2013 tragedy. John Hancock has continued to provide bibs for the team. The funds raised by the team provide critical support for emergency care, disaster relief and disaster preparedness training at Mass General, efforts that benefit victims in Boston, the nation and the world. More than 140 runners a year participate in the Boston Marathon through Mass General, up from 10 in 1998, the first year of the John Hancock partnership. 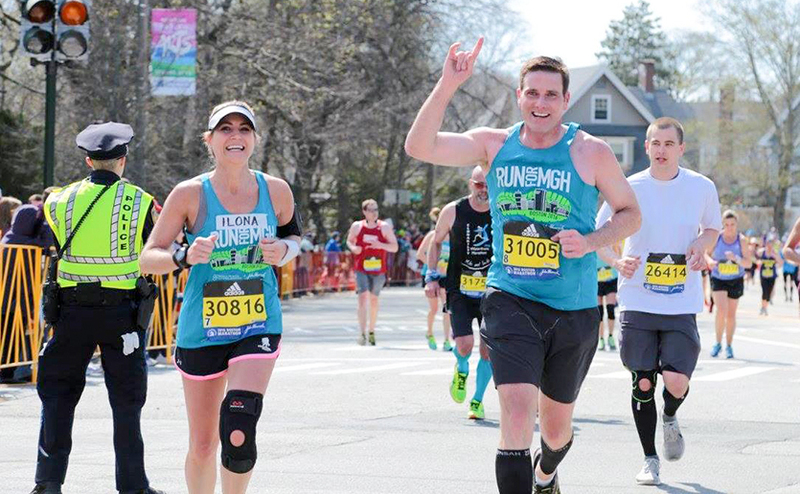 In addition to the Pediatric Cancer and Emergency Response teams, runners who obtain their own bib numbers for the Boston Marathon run for the Miles for Mass General program, which raises funds for hospital programs that are close to their hearts. Programs being represented by 2017 runners include Botswana Oncology Global Outreach, Caring for a Cure, Cystic Fibrosis, Down Syndrome and the Lurie Center for Autism. In the meantime, just having one of the John Hancock bibs and being able to run has provided a powerful sense of contribution and empowerment to the likes of Marybeth McCarthy Caldwell. A registered nurse in Mass General’s Department of Emergency Medicine, she had just crossed the finish line in 2013 when the first bomb went off. Ms. Caldwell is running the 2017 Boston Marathon on the Emergency Response Team because she knows full well how critical well-trained emergency responders are. “The fear that consumed me in 2013 will never stop me from running again,” she vows. Please consider supporting the Boston Marathon runners raising money for Mass General. To learn more about the Mass General Boston Marathon Program, please visit our website. Help the runners who support Mass General.